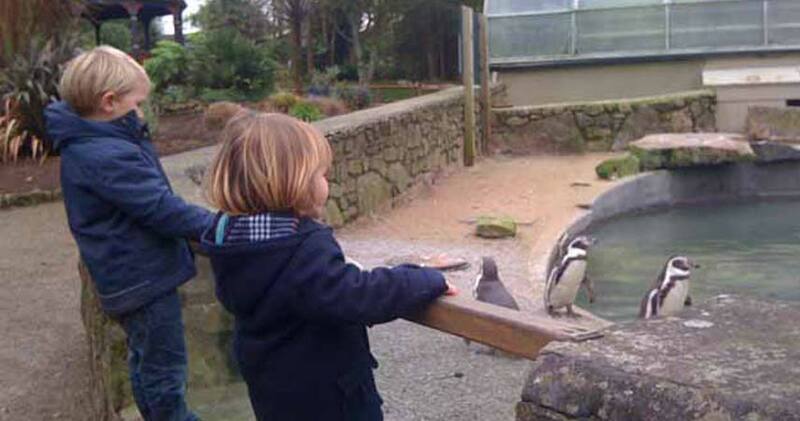 Paradise Park bird sanctuary and wildlife park is one of Cornwall’s most popular attractions for families with young children, and it’s not hard to see why. Nanny Pat is a regular visitor with grandchildren Wilf and Megan. Here’s what she has to say about it. Paradise Park is one of our favourite days out. It’s a great place to visit all year round and has a fantastic indoor play area which is ideal for under 5s. We usually spend the morning doing a circuit of all the bird and animal areas outside. There are some incredible, colourful birds, including parrots, flamingos, toucans, peacocks and Cornish choughs. The Fun Farm has donkeys, goats and pigs to pet, and there’s a lovely little area with gerbils, guinea pigs and mice that all have their own little houses. One of the best things is feeding the penguins – Wilf and Megan love feeding them fish by hand. They also really enjoy visiting aviary with the lorikeets. At certain times of the day you can go in with the keeper and the birds will fly down and eat food out of your hands – a real treat! The cafe’s very good and a nice place to stop for lunch before giving the children chance to let off steam in the Jungle Barn indoor play area, which has soft play, giant slides and special toddlers’ area. Paradise Park is highly respected for breeding and rescuing birds and animals. They’ve been running The World Parrot Trust for 25 years (a charity that works around the world to save rare parrots) and they’re also involved in schemes to help support native birds and animals such as red squirrels, otters, barn owls and Cornish choughs. Paradise Park was awarded a coveted Trip Advisor Certificate of Excellence in 2014. It’s open open every day from 10am (except Christmas Day). There’s plenty of free parking, easy access and good toilets and changing facilities. There are often special activities during school holidays – check the website for more details. Top tip: If your children love birds and animals and you think you might visit more than once during your holiday you can buy a return ticket for your next visit at a discounted price of £3.99 per person.